I have been a persecuted whistleblower for the past 11 years . I was heartened by the presentation given by the Transparency international president and I certainly hope that Transparency International New Zealand accepts the importance of whistleblowers . I was not an employee of the organisation I blew the whistle on but in My line of work as a Private Investigator I discovered that our government had given coercive law enforcement powers to a fictional organisation . I thought it would be simple to bring it to their attention and was not prepared for the onslaught that followed . While the country is jumping up and down about an address in Mt Eden used for election purposes and some extra flat mates we are rather ignoring this massive public fraud , how can we make fish of one and fowl of the other. The origins are with labour and it continued under national . Kennedy Graham once met me and we talked about y issue at length .. he did nothing yet he is miffed with the relatively minor indiscretions of his leader . 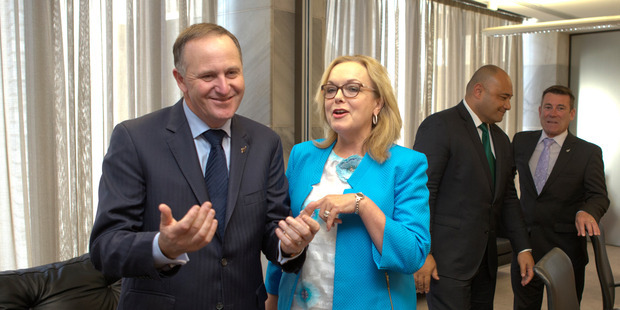 The fact that this Fraud has gone on for so long without any one looking at it shows that the fraud situation in NZ is far worse than any one can imagine. This case proves how in reality those in power condone fraud . I hope that transparency International looks at the issues that whistleblowers face , We don’t expect you to do anything more for us than to look at our cases and see how they impact on the reality of the integrity of the public service. In writing the bill he saw an opportunity Not only did he write the bill to update legislation he also used it to facilitate his own business plan see here the document drawn up in 1996 clearly shows his intention to make money from this. He goes on to write the no 1 bill for the new legislation without declaring his conflict of interest. A second bill is introduced by National . Both bills go before the select committee and again without declaring his conflict of interest Neil Wells becomes ” independent” adviser to the select committee . He set up courses at UNITEC for training the inspectors for the new legislative requirements, a role he was to take on personally for $$$ . He spoke of an organisation which would have the same powers as the RNZSPCA and he called this AWINZ ( Animal Welfare institute of New Zealand ) .This organisation existed only in his mind. AWINZ did not exist in any manner or form, there were no trustees , there was no trust deed yet he called himself a trustee and made out through the application that AWINZ existed. Neither MAF nor Waitakere city council had a copy of the alleged trust deed and it was only then that Neil Wells produced one and I suspect that the ink was still drying . He gave me a copy see here and sent a different copy to Maf see here . Note that both are different to the one attached to the application. To me this proves that the man had absolutely no hesitation in forging documents . I have truckloads of documents and have taken this matter to the Ombudsman, ministers court and have found that I have been under attack because of it. I have simplified the whole matter and ordinary people get it they understand but those in MPI and in so called positions of accountability don’t look at the facts they look at the reputation of the persons, some I fear are acting in self interest as some where at a previous time they had a finger in the pie and covering up also saves their own necks . I have been at the receiving end of an 11 years smear campaign while Neil Wells promoted himself as being holier than though . That was until he was proved to be corrupt but he then had the advantage of having his name suppressed. The application is fraudulent and resulted in a fictional organisation getting law enforcement powers. The persons who were allegedly trustees had never met never passed a resolution never consented to being a law enforcement authority , never took part in the operations or decision making or application for “ awinz “ to become an approved organisation . Then he supplied a copy of the deed to Maf except he had to change the details of the deed again and another deed was concocted and sent to them. He made an application for the position of dog and stock control manager see here and effectively contracted to himself for the services of AWINZ See the document MOU Waitakere where Wells signs this On behalf of the fictional Animal welfare institute of New Zealand with Tom Didovich the person whose job he was to take over . Note: that there is no mention of the conflict of interest in the application for the job , he treats AWINZ as though it is a legal person separate from himself when in reality he is the only person associated with AWINZ and this is in reality a trading name for himself. this could have been easily dealt with . In the first place MAF did not check they assumed and gave law enforcement powers to a fictional organisation . Our internal systems for dealing with this type of offence do not exist and every one was quite happy to stand by while I was beaten up from all angles. Who were the trustees .. there were none there was no trust therefore no trustees. Should MAF have ensured that AWINZ existed legally ..
was the trust deed attached to the application in 1999 and the one provided to Maf in 2006 the same.. no therefore consideration of the unsigned deed by Maf was irrelevant. Did Neil Wells work in a situation of gross conflict of interest .. YES!!!!!! Is the AWINZ Charity complicit in fraud on the courts ? Ben Atkins of Brookfields has told me to pay the $19,000 cost demand payable to AWINZfor the legal action for obtaining a judgement by fraud into a bank account number National Bank of New Zealand 060 968 0067 4 77 00, this is the bank account used by the charity animal welfare institute of New Zealand, it is not the account for Hoadley wells and Coutts parties to the litigation . Before I pay this money into the account I wish to inform all those associated with the charity, the person running the account and those party to the legal action ,of the implications of receiving these funds which have been directed to be paid for deceiving the court. For 8 years there has been much obfuscation about who AWINZ is. I have evidence to prove that the charity the law enforcement authority or the former trust. The charity does not run its own bank accounts Neil Wells does and the trustees are not running the charity in any proper manner. They are not even meeting. In 2007 there was no trust deed associated with the national bank account I am certain that the banking ombudsmen will help sort that one out. The account was in the name of a person who does not exist- animal welfare institute of New Zealand . Neil Wells was the only person running the account and the account was not a trading as account. I will not pay into a bank account of a non-party without some assurances and without the full knowledge and consent of those whose account it is being passed off as being. I will not hand over that sum of money and then find that those who have a judgement against me demand the money again in their personal capacity. As the account is that used by a registered charity, I request that all of the trustees of the charity AWINZ consent to the money being paid into that account and that they accept full responsibility as trustees for receiving the money which has been obtained through deception on the court and perverting the course of justice. I note that the lawyers have gone on leave and so will deal with the parties involved direct as the lawyers appear to be totally confused as to who is who. The lawyers in any case were not instructed by the charity but by Hoadley and Wells at a time when no trust existed. I will show there is no continuity to a previously formed trust. On 20 November 2009 Justice Hansen dismissed an appeal by Haden in the High Court. The Trustees have entered a charging order of $100,000 on properties jointly owned by Haden. Now my issue is that I have paid some $200,000 to Neil Wells alone, not in his capacity as trustee and I have paid $16,000 to Wyn Hoadley in her private capacity and according to these “true and correct” accounts you have a charging order over my property. I would like to know which property you have a charging order over and I would like proof that it has been removed, I also want all references of any debt to the trust removed as I have never had a debt to the charity . I also dispute that there is any money owing to the charity and I do not wish to put money into the charities account thereby giving reality to their fiction. I will put the money in that account if I get acknowledgment from all the parties as to why I am placing into that account. The whole thing has been Identity fraud 101 and all those who go along with this are complicit in obtaining a pecuniary advantage through fraud and perverting the course of justice. Facilitating something is enough.. each one of you is a party to this fraud. I will expect a response from each of you by 4 pm 31 December . 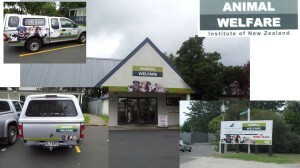 We registered a trust called the animal welfare Institute of New Zealand on 27 April 2006 and through this registration proved that no other legal entity existed by that name. Neil Wells wanted our trust gone and was informed of the process by the registrar of society’s , he chose litigation in the district court and coercive means. AWINZ operated from Waitakere city council premises using the council staff to run its business and prosecuted those who fell fowl of the animal welfare law. ( this money went into the same account which your lawyer now wants me to put nearly $20,000 in to- this account was operated By Neil Wells alone). The vehicles, signage and buildings at council had been re branded by the Neil Wells to look very much like the Logo which AWINZ the law enforcement authority used. There was talk of the council assets to be transferred to AWINZ as is recorded in the audit report page 4. Neil Wells had been Manager since 2005 when he took over from Tom Didovich the previous manager who had corresponded with the Minister of primary Industries and had given consents and approvals on behalf of council for matters which council had not been properly consulted on. As a result MAF and the minister were of the belief that it was the councils desire to take on animal welfare functions in reality it was Mr Wells personal desire one that he had recorded in a business plan. I asked questions as to AWINZ role and contracts with Waitakere Council and the existence of the law enforcement powers which were obtained after Mr Wells had written the animal welfare bill and consulted on it as independent advisor to the select committee. 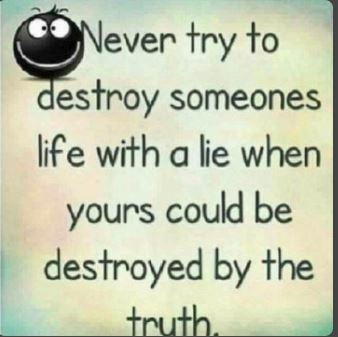 In July 2006 Wyn Hoadley, Neil Wells and Graeme Coutts commenced legal action, using clever ploys such as false standing and striking out my defence of trust and honest opinion in defamation proceedings they have managed to re write history and confuse facts . I now don’t know who I am dealing with I believe that there are various parties all called AWINZ and various ones have used the bank account which the lawyer has given me a number for . 6. The Awinz which met June 2004 which only Mr Wells knows about. 7. The AWINZ which opened the bank account and obtained the IRD number and obtained the $100,000 beauty with compassion. 9. You . the people who signed a deed 5.12.2006 the trust which became a charity and although you were not connected to the bank account let Neil wells and Christine wells operate the bank account which you were supposedly trustees of. Not all AWINZ’s are the same they share a common name but there has to be real verifiable evidence to connect them. 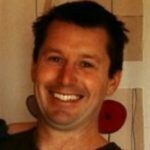 In 2012 I took action against Hoadley ,Wells and Coutts for obtaining a judgement by fraud but because their lawyers obfuscation and reputation had more impact on the court than the 700 odd government documents which I had collated , my claim was struck out at a cost of some $35,000 this and the preceding matters won by deceit has resulted in payments of $200,000 which has mainly been collected by Wells himself in his own capacity. Wells has been hell bent on bankrupting me and liquidating my company we have had three attempts at liquidation and in the courts own words it has been done in a very aggressive manner.. so much for animal welfare .. can’t be nice to humans. The latest round the invoices were made out to AWINZ, for them to be made out to AWINZ that is the charity then the charity must be itself involved in the perverting the course of justice , and I would very much like to establish if all of you that is the December 2006 trustees consider all the AWINZ entities 1-9 to be you . 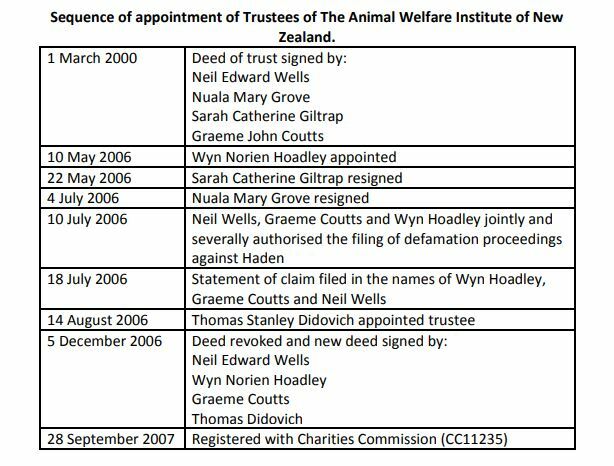 According to the charities web site you are the trustees of The Animal Welfare Institute Of New Zealand a charity registered 28/09/2007 after you all signed a trust deed on 5 December 2006. First of all you need to grasp that AWINZ is not a body corporate it is nothing more than a name adopted by various people, in this case you and only from 5 december 2006 . The trust therefore provides no protection for you for any act done before that date or for actions outside the scope of the trust deed. AWINZ cannot sue or be sued only the people who comprise AWINZ can sue and each does so based on legal documents which support their claim of being legitimate trustees. I cannot see how you can be a continuation of a trust allegedly formed 1.3.2000 as those trustees never met Let’s look at the audit report and associated document in detail to establish some facts which you yourself ( through the lawyers ) have promoted. The Affidavit of Tom Didovich which sets out the fact that he ( while holding he position of manager Dog and stock control of Waitakere city ) drove to each trustee and obtained their respective signatures , this proves they never got together at the start and could not have ratified the deed. Board meetings – we found that four Trust Board meetings held since 2000,three of. We know that the 2000 trustees did not meet when they signed the deed( see Didovich ’s affidavit ) , we know that there were only ever 4 meetings the earliest was 2004. Therefore the meeting in 2004 was by an unknown group of persons or person. Now let’s look at the Application for approved status 22 November 1999 how could this application have been made by those whose only act was to sign a trust deed 1.3.2000 , it is customary for people to sign such applications to show that they consent to it being made in their names.. This is not for a Sunday school picnic this is for law enforcement powers. “In paras 57-59, Ms Haden alleges that Mr Wells deceived the Court in “many ways” and in particular, she alleges that Mr Wells misrepresented that an application to the Minister of Agriculture on 22 November 1999, was not the final application made. We assume that Ms Haden is referring to Mr Wells’ evidence given in Court when he said that MAF could not receive an application as an approved organisation until 1 January 2000, when the Animal Welfare Act 1999 was passed. Mr Wells went on to stay that a formal application could not be lodged before that time and that when the Act was passed, a formal application was made, and the trust deed was signed (refer CB p 340, L8-23). Note how your lawyers cleverly still put the application before the signing of the deed , things just don’t happen in that order. Ms Haden’s claims of perjury in this regard are simply without any foundation. Mr Wells was entirely open with the Court about the formation with the trust and the application to be registered as an approved organisation. He noted that the November 1999 application was made, and this was attached to Mr Wells’ affidavit sworn 10 December 2007 (refer CB p 324, para 31 ). Further, the application was subsequently formalised, after discussions with government officials and further correspondence. In particular, Mr Wells sent a letter to the Ministry of Agriculture on 25 March 2000 to address various issues that had been raised, and to formalise the application (refer CB p 138- 144). Your trust and the 2000 trust were never incorporated so it was not your deed that was sent in to the Minister for registration and clearly was not the deed which Mr Wells was referring to. So how could this be YOU !!!!!! 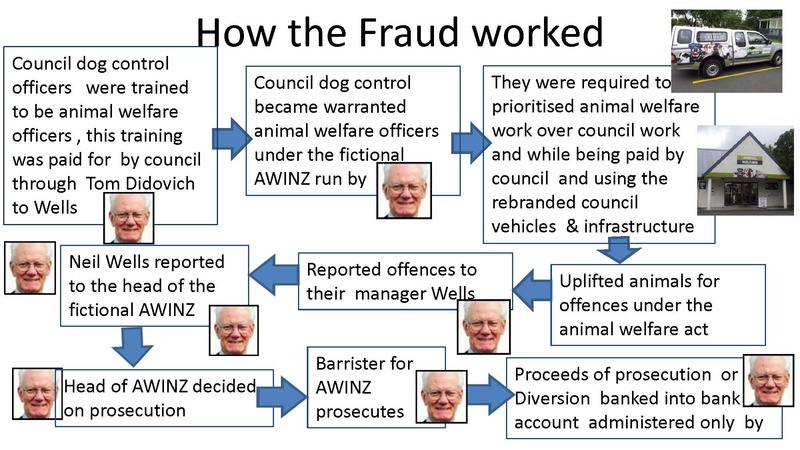 Wells also claims that the objectives of AWINZ “was ” to achieve a seamless transition for those officers of Waitakere City Animal Welfare Services who were currently warranted to be appointed as from 01 January 2000 or as soon thereafter as is practicable “ You will note that there is no mention of this objective in the trust deed 1.3.2000 which you claim to have as your origins that this objective is expressed. Neil Wells further stated that the principal purpose of AWINZ was to promote the welfare of. Animals, and its aims were “to provide a national body to which Inspectors will be properly answerable”. How can that happen through a trust which did not meet at all!!!!!! Look at yourselves you don’t meet you all know that Neil wells is the only person who deals with AWINZ the rest of you are there to cover up . On that point You did not meet to change the terms of the trust deed which you signed, there are no minutes which show a resolution to change the objectives, there are no meetings after 5 Dec 2006 which resolved that you should become a charity . I will get a full investigation into this you have been most fraudulent. Trustees have legal obligations including the requirement of a meeting to decide to take legal action. I believe that the only explanation is that the trust 1.3.2000 was not the law enforcement authority and Neil wells was it all by himself and all the rest is a cover up to pervert the course of justice something you have all conspired in. There are many other points I could raise which have come to light due to the audit report but I won’t go into that now after all it is Christmas. Those who want to save their necks can do so now. I will hand over the $19,000 + subject to being told by all parties to the proceedings that they consent to it being put into the charities account and acknowledging that the charity is receiving the money and know that it is money obtained by crime in light of this detailed letter. I will release the money as soon as I have the assurances and also an explanation as to why the charity is claiming the funds as theirs in the annual report when they are not a party to the proceedings and how they came to put the caveat over my property , or if they did not put a caveat over my property why they filed false accounts. If I don’t hear by 31 december 4 pm I will assume that You will not be responding and won’t be making any demands on me due to the fact that you are collecting the proceeds of a crime. Since its Christmas. Anyone who does not wish to be prosecuted criminally next year can come clean, I am sure the police can deal with the issue. Having the matter before the court has held it back but all that is finished now . You have cost me well over $300,000, my family and my marriage I am not about to walk away from the crime you have perpetrated, You have won the battle but not the war . You will be made accountable for your action and the part you played. Ignorance of the law is no excuse. Those who facilitate corruption are art of it. You can’t put your name to something and then say you are not involved. Copy on transparency.net.nz as usual. Sent: Monday, 14 October 2013 6:51 p.m.
First of all congratulations to all of you. I hope that you have got a better Idea of what I have been up against these past 7 ½ years. The corruption I questioned is pretty much the same as what the prosecution has been for on the north shore and the investigation is about in Auckland Transport . He also rebranded the council premises as per attached and if you look at the flow chart you will see how the fraud worked. I have been told this is historic but it was operating in 2010 and so were these other frauds which have been actioned. No whistle-blower should have to endure what I have been exposed to . I request an urgent meeting so that we can start dealing with this matter before I have to sell my house because of councils neglect to investigate. The last time you asked to meet with us, the advice that Councillor Fletcher and I received from legal counsel is that all of your allegations have been exhaustively investigated and there is no action that we as councillors can take. If you have any new evidence, please provide that to our legal department. I am copying in CEO Doug McKay and Acting General Counsel Jazz Singh. Sent: Tuesday, 15 October 2013 10:23 a.m. I have been somewhat unfortunate to have had Bias directed at me by your counsel Wendy Brandon . I have sent her evidence which any competent lawyer would recognise as being a conflict of interest in a mangers role however she responded that she refuses to investigate . I have supplied tons of evidence , I can conclusively prove that there was no trust in existence and the manager was using council resources and infrastructure for self-enrichment. He was contracting to himself using a pseudonym. I think the vital ingredient all along has been is that Mr Wells is a colleague of Bob Harvey and there is also involvement of former mayor Wyn Hoadley . This is serious corruption and the councils lack of action has had major repercussions on me and my family. I should have been able to ask the simple question Why is a manager contracting to himself without fear of losing my home. Council appear to have learnt nothing from this as I am dismissed as some freak. Just because former mayors are associated with the fraud does not mean that there is no fraud. I can appreciate that there is a huge amount of influence within council which has stopped this from being investigated. I am sure that Waitakere council fully knew what was going on but in the words of mission impossible they would have said “ if you are exposed we will disavow any knowledge of your action. “ The on going proof of this is the fact that I could not even get a straight response to my LGOIMA requesting why the branding at the concourse changed from Animal welfare to animal management. 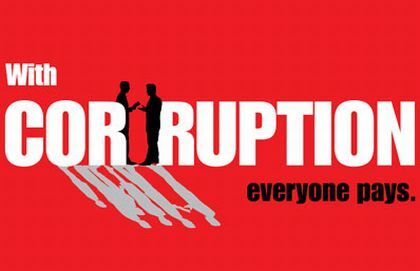 When council knowingly conceals corruption it condones it . I have spent nearly 8 years hitting my head against a brick wall. The very people who should investigate have not done so . I am a Fraud professional I have the evidence – it is conclusive , real and verifiable . I have given it to your lawyers and your CEO multiple times and I am discredited in return.. A good policy is to attack the person when you cannot attack the issue , I am sick of being discredited and I am sick of being bled dry by your former employee who is using the charitable funds of a retrospectively set up trust to do as much damage to me as possible. A proper council investigation would have prevented that- Most of the evidence is on your files! That is why I am again approaching the councillors. Cathy it was good to learn that you have a degree in criminology as such you may appreciate this perfect fraud .. it was a perfect fraud until I came along – few people would have picked up what I discovered, my mistake was to ask the question of accountability from council. I was taken to court for defamation and denied a defence of truth and honest opinion, NO EVIDENCE was ever produced and the court simply skipped the formal proof hearing, its like being sentenced without being found guilty ! . I have never done anything but speak the truth, the price I have paid is excessive that is why I stood and I am sure with the number of hits on my site that I have drawn attention to the issue . Wendy Brandon falsely claims that there is an injunction, there is no injunction against AWINZ. 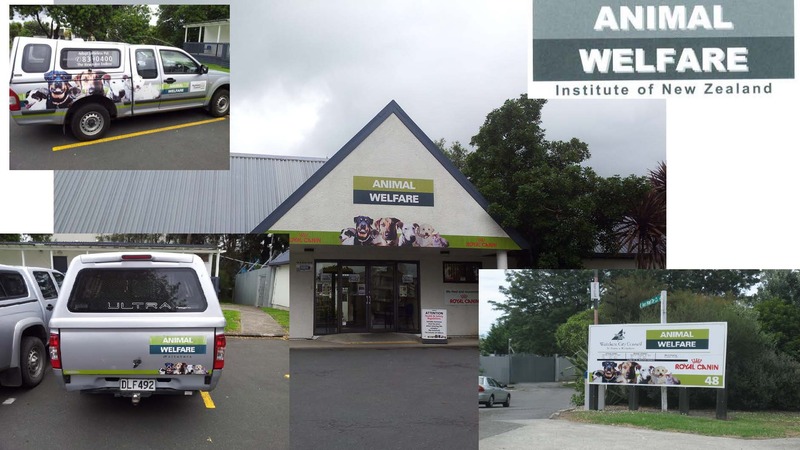 AWINZ (Animal welfare Institute of New Zealand ) does not exist, it had an appearance of existing and it was your staff, buildings and vehicles which gave it that appearance.. very clever really. The only injunction is against me saying nasty things about Mr wells, so I say nothing bad about him and only confine myself to producing documents which show what he has done, I frequently ask him if there is anything I have published which he wasn’t correcting and not once in the past 7 years has he objected to anything or taken me back to court. Cathy I Made another Request for Auckland council to investigate corruption last year and the end result was that Wendy Brandon had my emails diverted to exclude councillors . You have all the evidence- what is the point of giving you more when you won’t look at what you have . I even made a complaint with regards to the conduct of counsel to council but it appears to be a diverted email which only Ms Brandon received see Urgent call for the suspension of Wendy Brandon there was supposed to be an investigation into her blocking my emails and that disappeared into thin air. In return I was harassed by council and a person claiming to be W is posting the obscene things directed at me on web sites belonging to my associates . I can go blue in the face sending evidence to Ms Brandon she simply will not look at it that is why I am addressing this to councillors because you employ the CEO and he employs the counsel. If counsel does not take corruption seriously then that is an issue for the governing body. Cathy so here we go another three years of me being fobbed off. What do I need to do to get some one to look at the evidence. I am very happy to sit down with them and take them through it but in 7 years that has never occurred. I won’t hold my breath I know I will be ignored again. After all electioneering is over and were back as usual. You will be hearing a lot from me I would love to meet with you and Christine as this is a governance issue it is very serious.